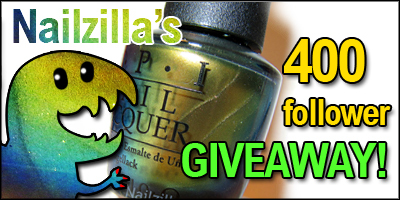 NailZilla: 400 follower giveaway winner! And the winner to the 400 follower giveaway is... Jessica P! I will be emailing you, please reply within 3 days, or I will pick a new winner. Thank you all for participating! Any thought on what you'd like to see given away next? for giveaways I love polishes I can't get myself. But since I live in the furthest corner of the world, that covers a lot of brands that are ETF in the US, lol.